Accommodation in air conditioned cabins with 70x60cm windows (in Suite, Deluxe and High Standard) or 20x15cm portholes (in Standard), ensuite shower (with hot water) toilet, toiletries, towels and beach towels. Full Boards Breakfast, lunch, dinner and snacks. Tea and coffee (instant) available 24h. Alcoholic drinks, soft drinks . All what specified under Carpe Diem S Holiday Activities & Services on board. Guaranteed perfect SUP waves! Fuller waves, deeper water, uncrowded, long rides. We know what you want and where to find it. This is the SUP dedicated surf trip you’ve been dreaming of!! Aboard the luxury 115ft Carpe Diem with her 60ft follow boat (Dhoni) and smaller tender she’s got 13 crew, is locally built and owned, perfectly set up for Surf, Diving and Fishing charters. Your Captain, on board Surf guide, Moon Tours host and Pauly will get you on the best waves in the area depending on the weather conditions. Sit back, relax, surf, dive, fish or drink cocktails from one of two bars on board. Early bird bookings; leave your boards at home with first option to lock in a board from our Maldives quiver FREE of charge. *Travel with SUP’s up to 9’6″ no oversize, no excess charges! Our Carpe Diem SUP Surf charters sleep 20 (max 10 surfers, additional non surfers welcome) and have a generous fuel allowance to escape the crowds and to find you the perfect waves in the perfect location. Scattered across the equator in the middle of the Indian Ocean, the gem like islands of the Maldives depict the rare vision of a tropical paradise. Palm fringed islands with pristine beaches, turquoise lagoons, crystal clear warm water and stunning coral reefs with abundant varieties of marine life and hosting a massive variety of world class waves that are now accessible to the travelling surfer. There are over 1,192 islands in the Maldives Republic, measuring 820 km’s north to south and 120 km’s east to west, the closest neighbors are India and Sri Lanka. People who have never been to the Maldives often have trouble comprehending that there is almost NO land. It is sea with little pockets of coral dotted on top of an old volcanic mountain range. Only 202 of the islands are inhabited; there are no hills or rivers: almost no tides, the highest point above sea level is less than 10 feet. Central Atoll standard waves are long and clean with size varying between 2 and 8ft as well. During southern hemisphere winter (April-October), it’s pretty much never flat. A lot of surfers prefer surf charter boats to access the many different points in the North and South Male’ Atolls. On a boat there are no constraints and surfers can choose among the most famous breaks. But try to insure you surf Cokes, Jailbreaks (Himmafushi), Honky’s, Sultans & Tucky Joes! They are amazing waves! Fishing has always been the lifeblood of island nations and the Maldives is no different, this place has been dubbed the ‘fishiest’ places on the planet. Pelagic species are often the favourite target although there are a lot of reef and shallow water species that will give you a run for your money like Bonefish, Barracuda, Groper, Snapper and the king of fish, the Giant Trevally. You will need some heavy duty gear to get the big GT’s found out here onto the boat. 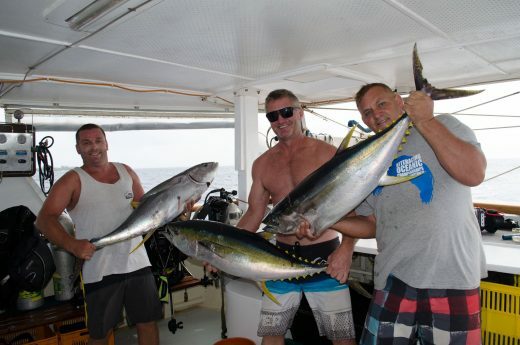 Cruising the deep waters along the outside of the reef Yellow fin Tuna, Dogtooth Tuna, Dolphin Fish, Wahoo, Sail Fish and Marlin all cruise these waters. With the freedom to fish off all three boats along with experienced fishing guides make sure you bring plenty of your favourite lures. Departing Male harbour in the Maldives you will find the island nations most famous waves in the North Male Atolls. The long breaks offer right and lefts for the beginner to intermediate surfer to the professional with waves ranging from 1 – 3 metres. In general SUP surfers may prefer the South Male Atolls depending on the size of the swell. A surf charter should be flexible, not locked into strict daily miles and locations. Rather it should be based around mother natures plans for the swell and wind. Because of this we will not finalise the Charter itinerary with the Captain and crew until closer to departure. With a generous milage allowance we have the luxury to travel further than any standard charter to get away from the crowds and into the best waves. Rest assured, you will get what you are looking for with a boat and experienced crew that know the area very well. We’ll be trying to get you to famous waves like Cokes, Jailbreaks, Honky’s, Sultans and Tucky Joes. They are amazing waves. MY Carpe Diem was hand build in 2008 completely out of wood in the Maldives. 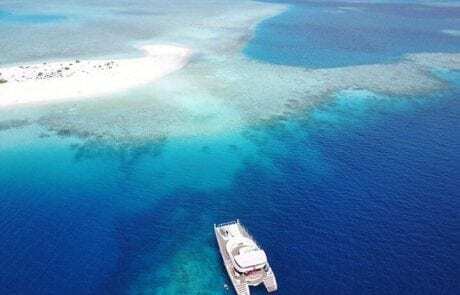 She’s 35m long motor safari yacht, has three decks, 10 cabins and can cater for up to 20 guests with two tenders to get in close to reefs, waves and the islands or for fishing trips. Carpe Diem is also kitted out for diving and will be an optional extra for our clients. With 10-13 experienced crew you can rest assured that every detail is taken care of. The 10 guest cabins include one Suite, one Deluxe Cabin, two Double Cabins and six Standard Cabins. All Cabins have individually controlled A/C, safety deposit boxes and ensuite bathroom with shower and toilet. Power on board is 220V with UK 3 pin types. We have a limited number of boars between 120L – 150L available for early bird bookings at no charge. Subject to availability. If you’re a surfer riding a smaller board or have your favourite there is no problem bringing your own and it’s pretty easy travelling with airlines like Singapore and Air Asia for example. Some T’s & C’s – Supplied boards are subject to availability and may change without notice or become unavailable. When someone is allocated one of our boards that board will be allocated to you for the entire trip. If you decide to let others use the board or swap boards around that is up to you. Consider the board your own for the charter. When it comes to damaged boards the person who has been allocated the board for the trip is responsible regardless of who or how the board is damaged. Allocated surfers will be responsible for any professional repairs that need to be carried out at a later date in Australia regardless of who or how the board is damaged. It is your board for the trip and you will be responsible for it. If you believe someone else is responsible for damaging the board allocated to you Moon Tours will seek repair costs from the person the board is allocated too and it will be your responsibility to seek compensation from third parties if choose. Unfortunately we do not have the ability to make professional repairs in the Maldives. If the damage is minor and we can patch the board up to keep you on the water that does not constitute a professional repair. If the board is a write off, i.e. creased or snapped the allocated surfer will be responsible for the full second hand market value of the board. Pack your favourite SUP, it’ll have to be around 9’6 max with some airlines claiming up to 9’8. Check with your chosen airline before booking your flights. Inflatable SUPs are great for some casual paddling & SUP yoga. We will have a couple on board for free use. Spare leg rope & spare fins and feel free to throw your game rod, lures and the short board or mini mal if you have room. If you are booking your own flights make sure you check your airline guidelines and luggage allowance. Pack your favourite swimwear and most comfortable clothes, dress for the tropics and get ready to relax. We will give everyone the chance to visit local and resort islands. On local islands it is respectful to cover your shoulders and knees while walking the streets and visiting local establishments. Resort islands usually charge a visitors fee of $100USD depending on the level of luxury which may also be used at the restaurant and bar, a way of making sure your spend at least $100 at the resort. Dress code depends on the resort and the level of luxury; in general you do not need to cover your shoulders and knees inside a resort but it might be a good idea to dress appropriately should you wish to have dinner at a five star resorts restaurant. The sun is HOT. We would be very very surprised if anyone needed any kind of wetsuit or neoprene tops while surfing, paddling, swimming and snorkelling. Should you like a wetsuit for diving we can provide one on the boat. Sun protection and keeping hydrated is important. You will be given your own reusable water bottle on board with access to unlimited filtered water and ice. Water tee’s, long and short sleeve, surf hats, sun glasses, lots of sunscreen as a minimum. WHO CAN GO ON A MOON TOURS CHARTER? Surfers, non surfers, family and friends are all welcome. 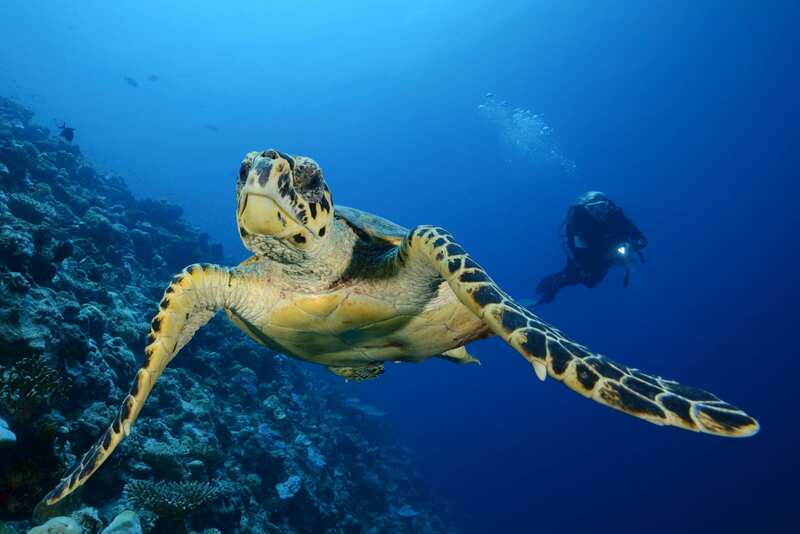 As a non surfer you will love cruising the Maldives on board Carpe Diem with plenty of opportunity to relax, wine and dine, swim, snorkel, dive or fish. Children upon request depending on group demographic, grand parents, the whole family, a group of friends or book Carpe Novo for business trip to impress clients or to reward your staff. They’d appreciate it. As Richard Branson says. ‘look after your staff and they will look after your clients’. Dive / Learn to dive. Rates below. Island exploring off the small tender. With book in one hand & a cocktail in the other this is the perfect place for some quiet rest & relaxation. Snorkelers are welcome too, apart from some dedicated snorkel trips, the boats all have a small speed boat (dingy) available for snorkelers to go snorkeling with our crew when the divers are out diving. Diving fees/rental gear are not included. There is diving gear available to rent on this boat. Please provide your rental needs. PADI Scuba Coarses available onboard Carpe Diem. Enquire for pricing. GETTING THERE WITH STAND UP PADDLE BOARDS. Limited Sunova SUP hire available. 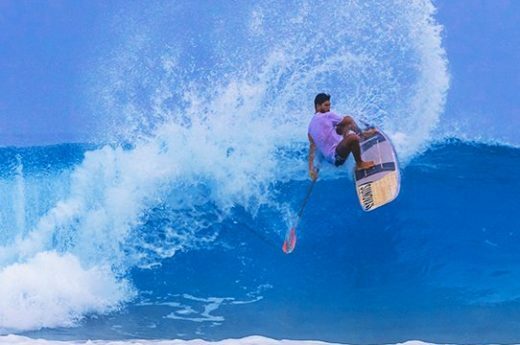 You have a few options but if it’s Surfboards and Surf SUP’s you want to bring then we recommend flying with Singapore Airlines or Air Asia to Male who will both takes boards up to 9’6. You will be met by your Moon Tours host and the Crew to chauffeur you on to the the waiting boat at the airport. Flying with Surf and Stand Up Paddle Boards. Pack your favourite surf board or SUP, it’ll have to be 9’6 or less flying with Singapore or Air Asia. Emirates from the United States will boards up to 300cm / 10′. Singapore Airlines have a generous standard allowance with up to 30kg / 9’6 max length in economy. Don’t go over the limit though, you can not pre purchase additional luggage and excess is charged at $42USD per kilo. Air Asia and Emirates offer pre purchased additional sporting allowance making it easier to bring multiple boards. Hire Stand Up Surf Paddle Boards. We have a limited number of high end quality SUNOVA Surf SUP’s available as well as a local contact for hire boards. We understand that particularly flying from the Unites States it can be tricky to bring your own Stand Up Paddle board. Please contact us for availability. Take the hassle out of finding the best flights, the right arrival time, board allowances ect, let our agent take care of your flights at a small ticketing fee of $25. For up to the minute availability contact one of our specialists. Rates are based on a 12 person private charter. – 6 x Lower deck, standard cabin. – 2 x Mid deck, double / twin cabin. – 1 x Upper deck, Deluxe cabin. – 1 x Upper deck, Suite cabin. 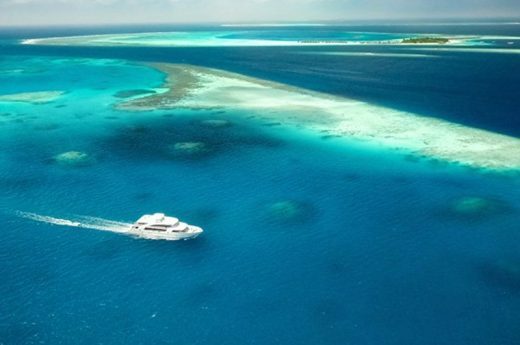 Extend your surf charter in the Maldives or connect through to Africa for a luxury Safari, China, Myanmar or Egypt for a luxury River Cruise. These guys are the best! Ready to accommodate unexpected changes, mindful of requests and working with amazing partners, they made our week long trip in the Maldives aboard the Carpe Vita one for the books! The balance of scuba diving, surfing, SUP, kite boarding, and yoga/pilates activities were customized to our group’s active desires with plenty of time for other off the beaten track surprises and cultural experiences. I look forward to doing another tour with them!